A feisty, aggressive and dynamic player, Richards played for England at every level from Under 16 upwards. He excelled for two seasons with the England Sevens squad, winning the Hong Kong Sevens in 2004. Richards made his senior international debut against Australia in 2006 and earned a further 12 caps, the last coming against New Zealand in 2008. He was part of the 2007 World Cup Squad, playing in every game, including in final as a replacement flanker for Joe Worsley. 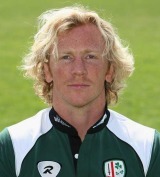 In two spells with London Irish, Peter made 86 appearances and scored ten tries for the club. He also played for Gloucester, London Wasps, Treviso, Bristol and Harlequins, appearing in a total of 151 premiership games and scoring 21 tries. He played in 50 European games scoring 15 tries which included winning the Heineken cup with Wasps and the European Challenge Cup with Gloucester. A back injury limited his appearances for the Exiles during the 2009-10 season and he was forced to retire from the game following specialist medical advice.